NASA has discovered organic material in soil samples on Mars, as well as methane in the planet’s atmosphere, the agency announced on Thursday. To be clear, these discoveries aren’t necessarily signs of life, but NASA says they’re a “good sign” for future missions exploring the Martian planet. Both findings were published in two separate studies on June 7. The methane discovery is particularly promising for astrobiologists. While methane has been detected in the Martian atmosphere before, today’s discovery (published in Science) reveals that the methane seems to follow a repeating seasonal pattern. That suggests the methane is released from beneath the surface of the planet. And the patterns could be key to figuring out where the methane is coming from. Theories abound, but scientists believe that water-based crystals or microbes could be a source of the gas. Additionally, another study published revealed that the Curiosity rover has found organic material preserved in rocks. 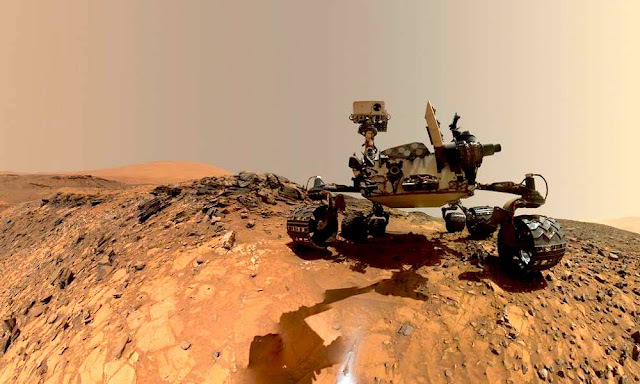 Through material analysis, Curiosity was able to find molecules that are roughly comparable to similar samples found in organic-rich soil on Earth. They’re not “living,” but they could be fragments of larger molecules that were present in the ancient Martian atmosphere. Previously, NASA revealed that there is clear evidence that the ancient Martian ecosystem could have allowed liquid water. That’s a key ingredient for life, and the Curiosity rover has also discovered other building blocks for extraterrestrial life. All in all, finding organic materials and methane in Mars’ atmosphere has pretty massive implications. Along with previous discoveries, they reveal that the Martian ecosystem may have been able to support life with conditions that could be compared to Earth’s billions of years ago. And both discoveries are a good sign for future exploration. These discoveries give scientists “confidence” that upcoming endeavors will find even more organic matter.